... the PC Engine version of Jigoku Meguri (aka Hell Explorer or Bonze Adventure, depending on where you live). Astute readers will recall that I discussed the change of heart I had in regards to this Taito platformer in this recent "Second Chances" post. 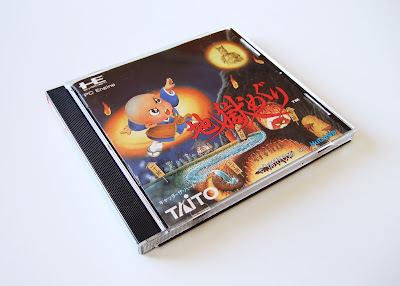 One thing I think I failed to mention in that post is that the PC Engine port of Jigoku Meguri admirably follows in the footsteps of a number of other Taito-published HuCards--including Don Doko Don, KiKi KaiKai, Mizubaku Daibouken and The New Zealand Story--as spot-on arcade conversions. As is the case with most of these "12 Games of Christmas" posts, a few additional photos of this game can be found in my Flickr photostream. Man, it looks like you really cleaned up this Christmas! If I do half as well as you, I'll be doing well. I'm 98% sure we're not getting iPhones this year...which is disappointing. But that means that something else is coming, I guess. Well, just remember that these are games I either received for my birthday or Christmas OR bought for myself betweey my birthday (around Thanksgiving) and Christmas. Honestly, just one of the games included in this series thus far was given to me -- that game being Kirby's Return to Dream Land. All of the rest were bought with birthday money. That's going to continue to be the case right up to the last two days, by the way -- just in case you're curious :) I spent less on the whole shebang than you might think, though. After all, games like Mr. Driller don't really cost much these days. Sorry to hear you won't be getting iPhones, though. Hopefully you get something just as nice, or at least nearly as nice! Can't wait to hear about it regardless. Oh dear God I miss box art and packaging like that!